Rumors Facebook is always secretly recording you have long refused to die, but it turns out Amazon may be the first tech giant to achieve the age-old dream of a total advertising Panopticon. On Friday, Amazon released the new Alexa Mobile Accessory Kit, which is intended to help developers integrate the company’s personal smart assistant into smaller devices like “headphones, smartwatches, fitness trackers,” and more, per Ars Technica. According to Amazon, the new kit “enables OEMs to add Alexa to their devices with minimum investment in hardware or integration efforts” by streamlining the amount of coding necessary to implement the assistant. Essentially, it allows developers to simply connect these small devices via Bluetooth to an instance of the Amazon Alexa App running on a mobile device. That app has been available for quite some time. But as Slate noted, the wearables and headphones push is designed to make it more competitive with Apple and Google’s assistants, which are already more seamlessly integrated into iPhones and Androids. Right now Amazon Echo and other smart speakers are hot products, but mobile devices that aren’t tethered to one spot in your home are clearly the next phase. It’s not a coincidence, though, that at the same time Alexa is racking up app-based skills that might be worth using on the move—like easier integration with smart appliances or Uber and Lyft integration—there are widespread rumors Amazon is investing a lot of effort into making sure it starts hitting users up with ads in the near future. 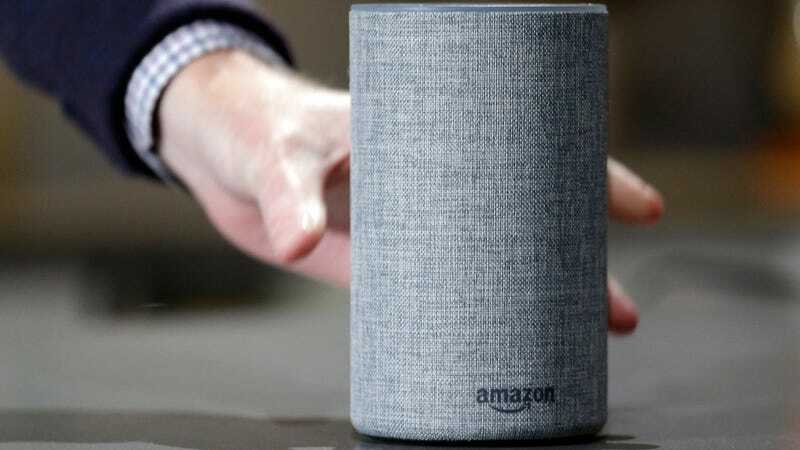 While Alexa is already doing some paid promotions, CNBC recently reported that the company is planning on making a truly “serious run at the ad market as early as this year”—one of the primary reasons it may have such a vested interest in literally whispering into customers’ ears. Amazon is already making retail acquisitions like Whole Foods and it’s rumored to be planning the purchase of a major department store chain. This could all work out very nicely for Amazon, allowing it to sell brands ads that lure customers to its own subsidiary stores even after they leave their homes. As Ars Technica noted, one of Amazon’s existing partners is already GPS manufacturer Garmin, so it’s not a stretch to imagine a future where Alexa-enabled earbuds start telling users exactly what store to pick up milk on the way home, how to get there, and which brand to buy once they’re in. It may even start suggesting what else to pick up while they’re there. In many ways this reality is already here. Amazon denies that rumors Alexa will start serving ads, but there’s really no reason not to start offering more and more paid promotions of this variety if customers’ comfort level with disembodied corporate voices talking to them continues to rise. That this all relies on customers willingly letting a for-profit smart assistant make more and more of their choices for them is sort of upsetting, but hey, so far there doesn’t seem to be many constraints on what Amazon is capable of pulling off. Amazon Buying Target Is Bananas, Right?